Great Danes occur in a wide variety of coat colors. Although the alleles causing all the coat colors have not yet been identified, DNA tests are available to identify the presence of some of these, which are outlined below. There are two common alleles in Great Danes at the E locus: Em and E. Em produces a melanistic (dark) mask. It is only visible on fawn or brindle dogs. So the mask is not visible on Harlequin, Mantle, merle, or white Danes, and is not distinguishable from the body color on black and blue Danes. Since the presence of mask is dominant to its absence, one does not know if a dog with a mask is Em/E or Em/Em, unless one parent did not have mask without DNA testing. 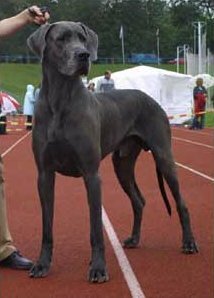 Blue in Great Danes is caused by the presence of two d alleles. Blue is carried by some black, fawn and other colored Great Danes. A dog with only one d allele is never blue, but can produce blue. A d/d genotype would cause a fawn Great Dane to have a blue mask instead of a black mask if the Em allele is present. A d/d genotype would cause a brindle Great Dane to have blue instead of black stripes on a pale fawn. All Great Danes are ay/ay at the agouti locus so there is no need to test for alleles at the agouti locus. Although DNA tests are not yet available for alleles of the K locus, recent research has shown that black or blue dogs have at least one K allele. At the present time there is no test to distinguish which black or blue dog might carry brindle or fawn, which is caused by the presence of recessive alleles at the K locus. Brindle dogs have at least one copy of the kbr allele (they may have two). Fawn dogs do not carry brindle because they are k/k. There is also no DNA test for Harlequin at this time. It has recently been proven that Harlequin dogs all carry at least one copy of the merle allele. Danes can carry one of the alleles causing brown, although these are very rare. Dogs that are b/b, will have chocolate coats instead of black or pale brown coats instead of blue. The markings would be chocolate on the Harlequin or merle dogs. Testing for the b alleles is not routine, but is available at no extra charge. The alleles at the A and E locus were identified by a collaborative research project between the labs of Dr. Greg Barsh at Stanford University and Dr. Sheila Schmutz at the University of Sascatchewan, who also identified the B locus alleles. The d allele has been identified by a collaborative research project between the labs of Dr. Tosso Leeb and Dr. Schmutz. Many dogs owners helped by contributing either individual samples or samples from complete litters. *subject to HST for Canadian residents only. Note: Mask gene (Em) is considered as an individual test, separate from other alleles in E locus. Testing for 3 alleles - E, B, and D - should be calculated as $55 + $20 + $20 = $95.00. The price will be automaticaly calculated during the process of ordering a sample collection kit. 1. Blood sample in a lavender top tube. Test results are usually available in 10 Business Days from the moment the samples arrive at the laboratory. Test results can be reported by e-mail, fax, or by phone. HealthGene will provide a certificate for each test result.